I just began implementing a new class behavior reward system. which are both individually based. There is a paw for my homeroom, math class, and reading class. They can earn points each week for making good choices as a whole group. On Friday they will have something special for that amount of time… extra recess, dance party, short movie, game, etc. My team teacher’s is dog-themed and adorable! I will take a picture soon to share. Today I just had my first observation of four this year! I wanted to share it with all of you incase you could use it in your classrooms. We were reading Big Bushy Mustache from our anthologies. Our purpose was to demonstrate how Ricky showed determination by describing his actions, words, thoughts, and feelings. I began the lesson by playing this fabulous video that was sped up by a coworker’s son to fit better in my lesson. No matter what grade you teach this would be a wonderful way to introduce and build upon the character trait of determination. It helped bring the character trait to life for my kiddos! And they LOVED it!! They were cracking up and so was my principal. After much discussion of the adorable polar bear and the development of what determination is, we visited my brand new character traits display in the classroom. I am sorry the picture quality is not great… my phone is ancient! But the Iphone 5 is in the mail!! We discussed how a character’s actions, words, and feelings give us information about the character. Once we have that information we can make decisions about what kind of personality the character has and pick the character trait. Our focus was searching for the details to support a character trait. 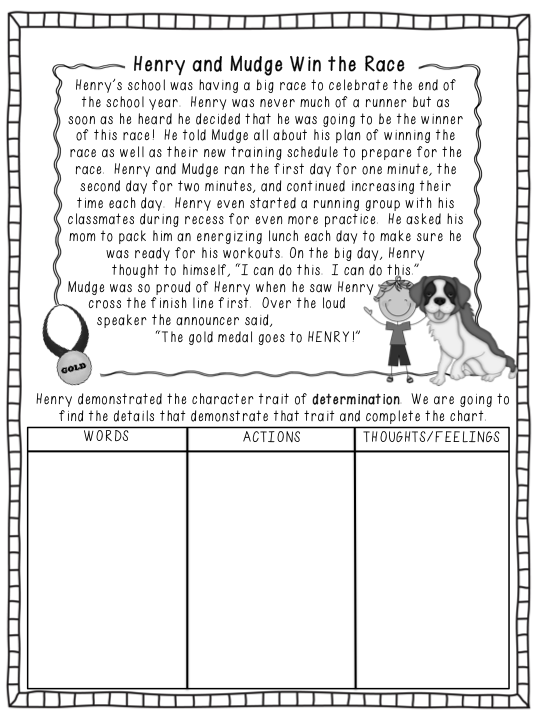 Together, we worked on ‘being detectives’ with some of our favorite characters Henry and Mudge. Students then spread out around the room to demonstrate their new learning by revisited our story this week, Big Bushy Mustache. The students had a deep understanding of what determination was and how we find supporting details for character traits. I honestly think using the polar bear video and familiar characters helped my students fully connect with the lesson! click on the mustache below! If you would like my brief lesson and CC alignment click here! Just what I needed today- to find your Blog!!! I'm your newest follower. Stop by anytime! 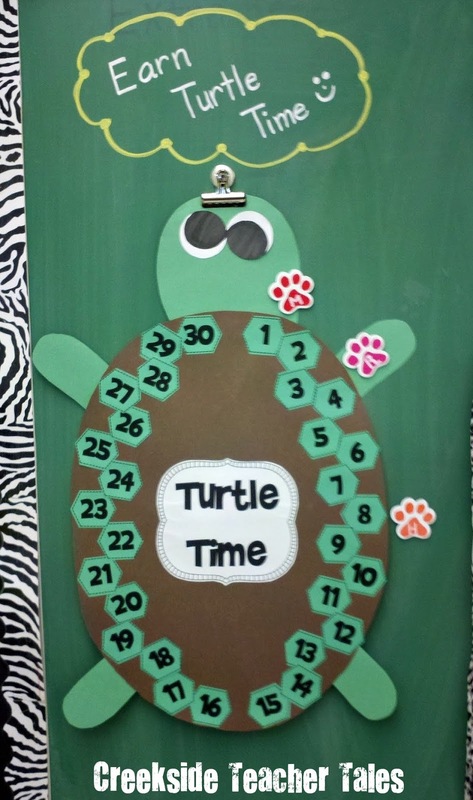 The turtle is cute and a great idea. Glad your observation went well! You are all set up for the huge giveaway at Rockin' Teacher Materials! Thanks so much for offering a product! Make sure to let your readers know so that we can all benefit from the exposure! Love your character traits activities. I will have to check them out on TPT. Love your character traits activities and posters but could not find them on TPT. Donna… the activities are linked here on my blog to download from Google Docs. The character traits posters are not currently listed anywhere yet. OMG I can't believe you're already on BigBushy Mustache already!! We must be waaaay behind. I have a fairly accelerated group so we move pretty quickly through the anthologies. We also skip some of the stories as well! I'm really working on perseverence and determination with my class this year. The polar bear video is just a blank box, can you possibly link it another way? 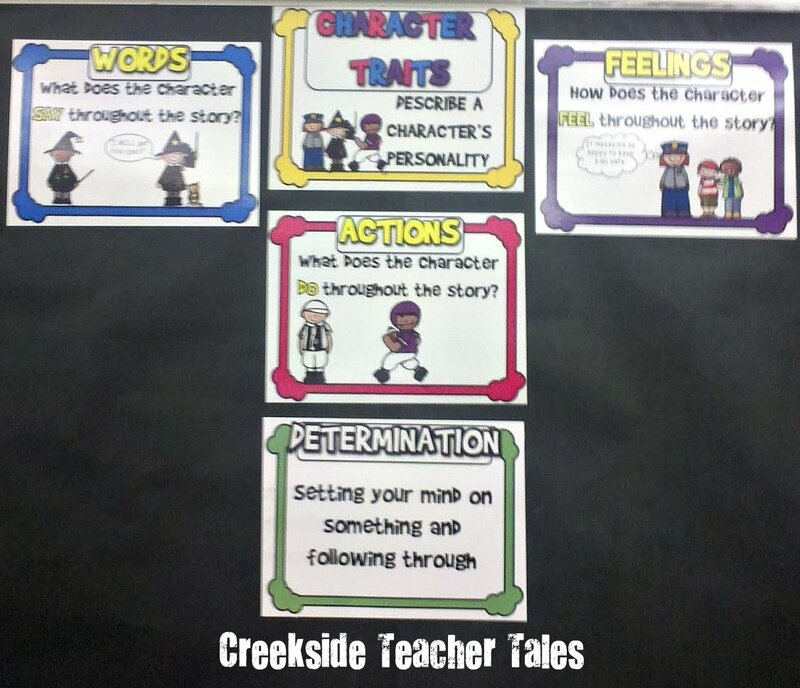 Do you plan on posting your character trait posters on TPT? I've been looking for something like them for a while now and have come up short on TPT and Teacher's Notebook.